Being in Tennessee, Hendersonville is no stranger to wet weather. What most business owners from Hendersonville might not know is the affect that water may be having on their foundation. When soil is loosely compacted, and there is a lot of water present in that soil, the pressure builds up around your foundation walls. This is called hydrostatic pressure. This pressure will undoubtedly put your foundation walls under pressure to the point they can bow, lean, and crack. This can lead to foundation failure or at best, leaks in your basement walls. A wet basement means mold and mildew and unsafe air for you and your customers to breathe. Luckily you have the foundation repair Hendersonville Tennessee team of Atlas Piers of Atlanta at your fingertips. We can be there in a moment with a solution to your foundation problems. 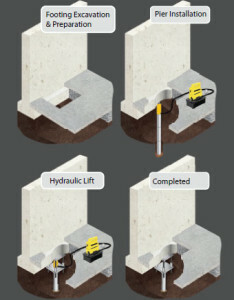 We offer underpinning solutions using “the very best” products from Earth Contact Products. We can utilize helical piers, resistance piers, slab piers, and wall anchors to provide that much needed support. For this type of installation you need an experienced foundation repair specialist. The helical piers and steel push piers are installed into the deeper soils under your foundation. The added support spreads the load of the foundation and upper floors more evenly when placed on multiple piers. When doing the foundation repairs in Hendersonville, TN, the team may recommend that you add some carbon fiber sheeting to any leaning walls or bowed walls. The carbon fiber sheeting is one more defense to protect your foundation walls.The foundation repair Hendersonville Tennessee experts at Atlas Piers of Atlanta have the expertise to perform any underpinning job you might need! We have solutions for you. If your Hendersonville home needs commercial foundation repair help, don’t worry – call the professionals at Atlas Piers of Atlanta today to assist with all your foundation problems. We are your commercial foundation repair Hendersonville Tennessee experts!